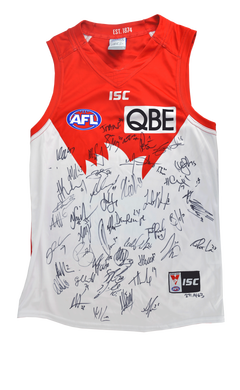 Don't miss this opportunity to own a 2018 team guernsey signed by the entire 2018 Sydney Swans squad. This item is unframed to allow for you to frame it in your own style. The guernsey comes complete with a Certificate of Authenticity from the AFLPA and AFL. Guernsey is marked 326/411 on the bottom underneath the locker label due to allocation process in signing. BID NOW. Auction closes on the 13th of December at 8pm (AEDT). Reserve for this guernsey is set at $250. If you choose to collect the item/s from the Sydney Swans office, a staff member will contact you when the product is available to collect. If you choose the postage / courier delivery option, the item/s will be dispatched as soon as payment has been received. Please note: guernsey will be be made available in January 2019. Please note: image is for display purposes only and actual guernsey may vary. For enquiries regarding the individual auction item please contact Sydney Swans Online Auctions directly on auctions@sydneyswans.com.au.